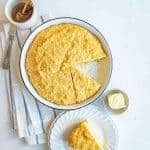 You’ll love this sweet and easy sour cream cornbread recipe that is slightly dense and moist, not too crumbly, and perfect with a bowl of soup or chili. Preheat the oven for 400 degrees F and lightly grease an 8-inch square baking dish or a 9-inch round pie plate. Make a well in the center of the dry ingredients and add the sour cream, egg, and melted butter.